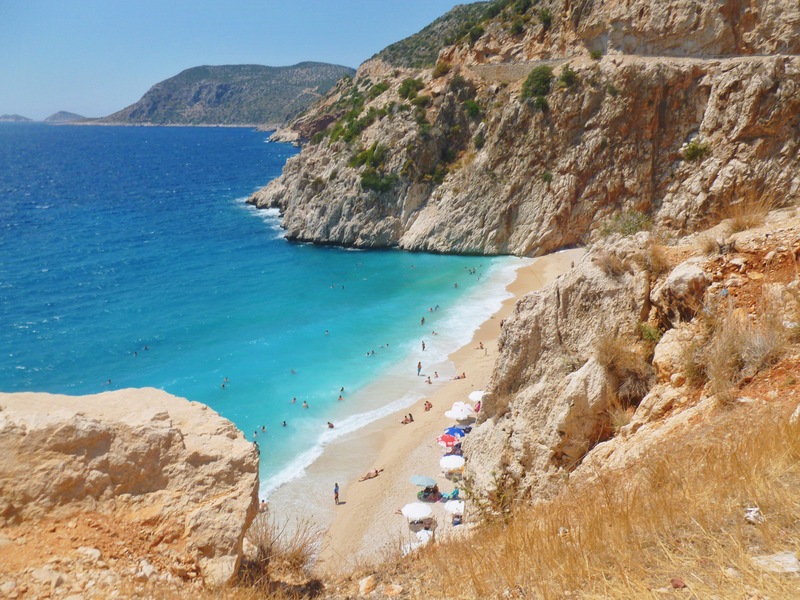 In between Kalkan and Kas, along the main coastal road, sits the beautiful hidden gem, Kaputas beach. The sea here is so turquoise and stunning, but does get deep quickly and is very wavy. The beach sits at the foot of a valley, and is only reached by walking down nearly 200 steps, or via boat. Walking down the steps is bearable, but walking back up is a real killer on a hot day! The beach is mostly untouched, aside from a couple of changing cubicles, and the natural beauty is just amazing. Entrance is free, but sunbeds and umbrellas can be rented for a fee. Parking can be difficult, as it gets busy and cars just pull up all along the main road. I climbed over one of the crash barriers along the road to take this photo – even if you can’t face the steps, it’s worth pulling over for a few moments to admire the view from above. The whole coastal road along this route is really beautiful.